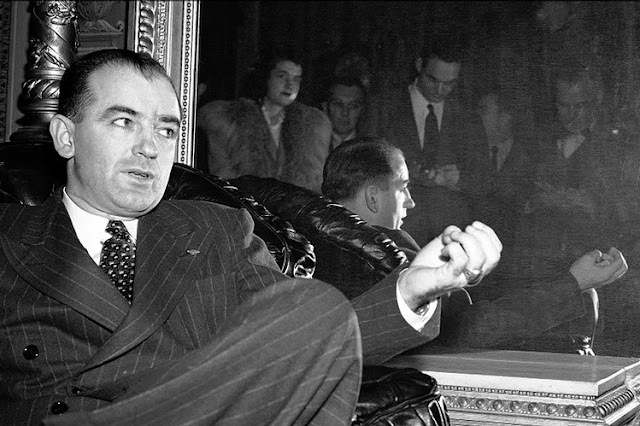 This morning we have the first German Communist reaction to the sensational charges in Washington against State Department leaders who Senator McCarthy says are pursuing pro-Kremlin policies. The official Communist party newspaper in Berlin prints a long commentary under the headline "Total Dementia in Washington." With unconcealed glee, the newspaper describes the charges against Secretary of State Acheson, Ambassador Jessup, and Owen Lattimore. The paper says it has its own reports from Washington that General George Marshall soon will be accused of pro-Communist sympathies and that even President Truman will be charged with being in the service of the Kremlin. Then, making a reference to the recent tragic death of Defense Secretary James Forrestal, the Neues Deutschland cynically declares that Truman, Acheson, and Marshall already have made reservations in Washington's Bethesda hospital for luxury padded cells. The Communist propaganda, in quoting our own Senate to discredit the American government, says that the massive attack on the State Department really is propaganda for the coming Congressional elections in which an imperialistic clique hopes to bring war to the world. 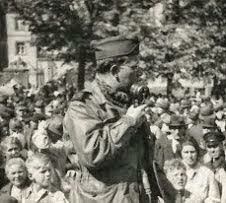 There is no doubt but that propaganda chief Gerhart Eisler is very happy about the whole situation. Army engineers continue to probe into the secret treasure trove of Hermann Göring today. Authorities are keeping very close-mouthed about their findings, but the loot already is estimated to be more than a million dollars in art objects, gold plate, rare wines and liqueurs, as well as a silver bathtub. The treasure was brought to Göring's Veldenstein Castle near Nuremberg and hidden in underground concrete vaults shortly before the war ended. There was another small riot on the border of the French-Soviet sector in Berlin last night. Several arrests were made and a policeman was knifed. Otherwise, the East-West Cold War today is being fought by railroad officials. Western rail authorities charge that German sleeper trains are picking up bedbugs going through the Soviet zone. The argument is about who will delouse the trains.